the Mountain Athlete: What is Boardercross? Snowboardcross, also called Boardercross, Boarder/Snowboard-X, and SBX for short, is a race between 4 to 6 competitors along a course comprised of a series of man-made terrain obstacles (banked turns, table-top jumps, doubles, triples and other combinations of rollers and gap jumps). Snowboardcross is heavily inspired by motocross racing (motorcycle/dirt bike). 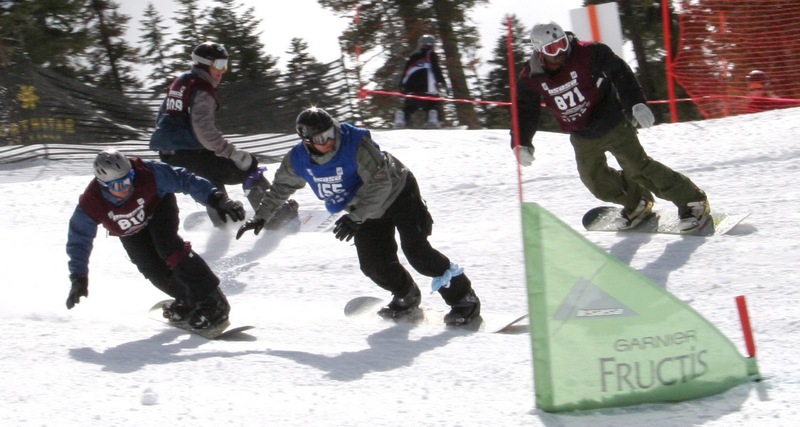 Similar to its motorized counterpart, Boardercross incorporates a mass start with a drop gate and start judge. Depending on the depth of field, each competitor will take a timed individual run (time trial) for seeding (ranking) against the other racers (sometimes their national points ranking is used for seeding). The top 32 men qualify for the competition and are placed in ‘heats’. At the gate, the starter will announce "Riders ready?...Attention! (or 5 seconds!)". Then sometime in the next 5 seconds drop the gate to start the race. On course the racers must navigate the obstacles while maintaining a line within the marked portion designated by triangular gates (similar to World Cup ski/board racing). Occasionally a rider may drift off course and must hike back up to avoid missing a gate or end up with a disqualification. In addition to negotiating the terrain, racers must manage sharing the course with 3 to 5 other competitors. In each heat the 2 or 3 riders who cross the finish line first continue on to the next round. The heats continue until there are only 4 to 6 competitors left for the final round. First one across the finish line in the Finals Round is the event champion.